So I'm sat here, the 10th September 2016 and I'm sorting out a very busy week in terms of my blog - I have so many exciting things planned and I clicked 'drafts.' On the 6th April 2016 I did my usual basic outline of a blog post (the name, the photos etc) which I will usually then go back to and add the text and decide when I will post it. Clearly on this occasion and I know why as I had a lot going on in my life at that time so that didn't happen but that's okay as you all can see it today instead, five months later!! 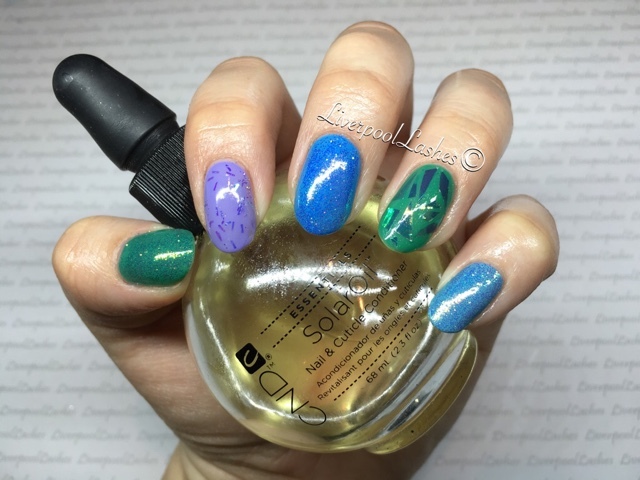 CND Shellac in Wisteria Haze, Digi-teal, Art Basil and Aqua-intance. 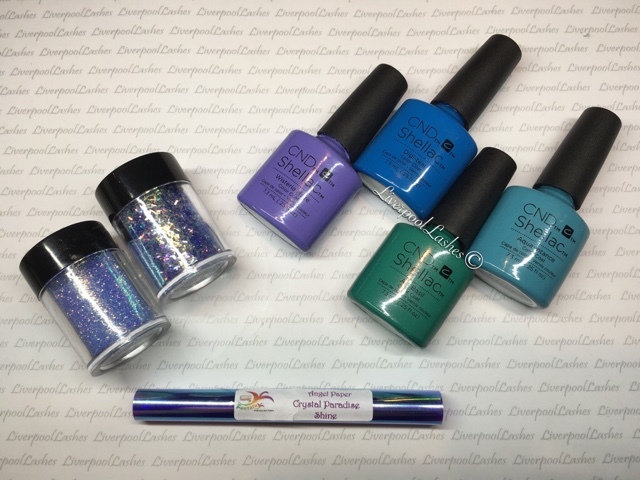 Lecente strand glitter in Aqua and iridescent glitter in Capri. My thumb and ring finger has Art Basil on it, my index finger is Wisteria Haze, the middle finger is Digi-teal and Aqua-intenance is on my little finger. Capri glitter is on my thumb, middle and little finger and I know I loved that the different shades made Capri gave different effects. I applied Aqua strands glitter to my index finger. Lastly I cut up slices of angel paper and applied it to my ring finger which wasn't the easiest thing as you need to make sure its completely flat to the nail but this was my first attempt as it and I was pretty happy with it. So there we go, a random nail of the day from spring...! I hope you enjoyed reading it this post. Don't forget to come and follow me on snapchat, instagram and twitter - search for 'liverpoollashes.' My facebook page is constantly updated with new releases, reviews and design ideas - click here to follow.